Jim Thome hit 337 homers with the Indians. When Jim Thome first started pointing his bat toward the pitcher, he never imagined that subtle movement would one day become immortalized. The Indians announced Saturday that they will unveil a statue of Thome at Progressive Field on Aug. 2. Cleveland’s career leader in home runs will be forever honored with the statue, which depicts him standing in the batter’s box and directing his bat toward the mound. Hall of Fame pitcher Bob Feller is the only other Cleveland player to also be honored with a statue outside the ballpark. Thome never could have imagined such a tribute, and is humbled by the salute. 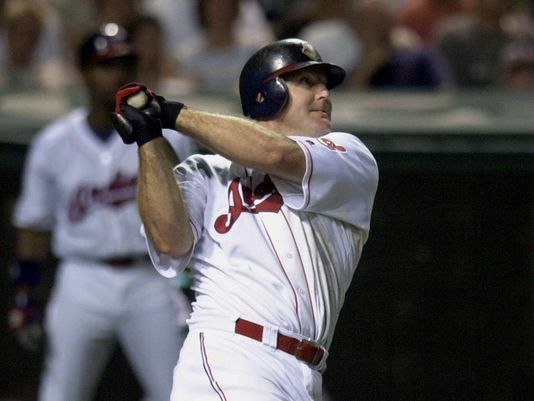 One of Cleveland’s most popular players, Thome hit 337 homers with the Indians. He broke in with the club as a slender third baseman in 1991 and developed into one of baseball’s most feared hitters. Early in his career, Cleveland minor league hitting coach Charlie Manuel, who went on to manage Philadelphia to a World Series title, suggested to Thome that he should point his bat at the pitcher to loosen him up before hitting. Thome had two stints with the Indians. He played with the club from 1991-2002 before signing as a free agent with Philadelphia. He also played for the White Sox, Dodgers, Twins and Orioles before retiring in 2012. Thome is currently working as a special assistant with the White Sox. You are currently reading Indians to unveil Jim Thome statue in August at ARE YOU NEXT.